Picture by Nadir Bouhmouch. All rights reserved.The Moroccan propaganda machine has recently adopted an environmental narrative to polish its image, both domestically and internationally. But how does this narrative look like from the perspective of a fish vendor murdered in the compactor of a garbage truck in Al-Hoceima? Or from the eyes of an ecological prisoner sitting in a prison in Errachidia? Or from underneath the mud and bamboo ceiling of a peasant’s house, crumbling underneath the claws of a bulldozer in Imenchimen where a hydroelectric dam is being built? 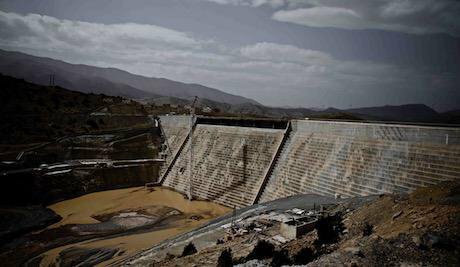 With the UN Climate Change Conference (COP22) currently coming to a close in Marrakech and the January 2016 opening of Noor (Morocco’s magnanimous solar energy project) the presses are shooting out one article after the other - touting Morocco as a role model for its environmental and renewable energy approach. They are right in a way, it is a role model, but only for capitalists who want to disguise their greed with an environmentally-friendly mask. 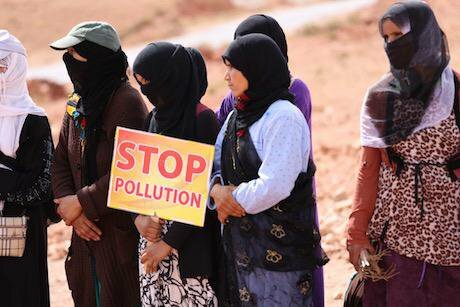 Let me explain further: the Moroccan state’s move towards renewable energy is not driven by environmental benevolence, it is purely driven by corporate interests. Over the last decade, the Societé Nationale d’Investissement (SNI), a royal holding, has increasingly invested in renewable energy through its subsidiary Nareva. Picture by Nadir Bouhmouch. All rights reserved.At this point, some may retort: “well, at least Morocco is becoming more environmentally-friendly!” To this the reply is: no, it is neither environmentally nor socially-friendly and I will begin with Noor, the crown jewel of Morocco’s greenwashing propaganda to illustrate why. Using concentrated solar power (CSP) panels which require large quantities of water to produce energy, Noor is located in a desert region already suffering from water depletion and the desertification of oases. The land on which Noor was built, formerly a collective tribe land, was practically expropriated. Two hours east of Noor and 300km South of COP22, near the small village of Imider, the biggest silver mine in Africa also sits on collective tribe lands. The mine is owned by Managem - the mining subsidiary of the SNI and one of the corporate sponsors of COP22. Managem rapaciously devours and pollutes the groundwater Imider’s peasants depend on for their subsistence agriculture and their livelihoods. No wonder the peasants in Imider formed a resistance they call “Movement on Road 96,” which shut down a water pipeline to the mine and established a protest camp, now going on its sixth year. Like their Native American counterparts in Standing Rock, they also have a motto: “aman iman,” which means: water is life/soul. Prioritising the sanctity of corporations instead of the sanctity of life, the Moroccan state sent the military to intervene against this peasant movement in 1996 and then again the military gendarmerie and the auxiliary forces in the last five years. The ecological prisoners of this movement continue to sit in prisons. Further north, for the sake of building a hydroelectric dam, the state forcibly evicted the peasants of the Imenchimen tribe near Midelt. The state offered 6 to 10 dirhams for land which the peasants estimate to cost 700 dirhams per square meter. Refusing to leave their land, the state sent its Auxiliary forces and bulldozers to destroy their snow-covered homes in the middle of the freezing Middle Atlas winter of 2014. The state claims the dam was necessary to provide water to the fruit, especially apple farms, downstream. Most of those farms belong to big landowners who shamelessly pollute the soil with fertilisers. Picture by Nadir Bouhmouch. All rights reserved.The phosphates used to produce those fertilizers used by agro-businesses throughout the globe are extracted primarily from Khouribga by another sponsor of the COP22: the Office Cherifienne des Phosphates (OCP). 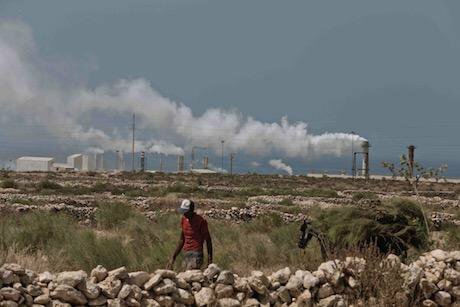 The phosphates are then processed in Safi, a coastal town which has seen its residents fall to the ground, asphyxiated by the gases released by the OCP processing plant only 2km away from low-income residential areas. Tuberculosis, cancer and lung diseases are common in Safi. The town’s hospitals are unequipped to treat the types of diseases caused by the OCP and medical impact studies have been forbidden by the state. Formerly a thriving fishing port, Safi’s fisheries have practically died out due to the boiling toxic waste that plunges directly off a cliff into the ocean below, in addition to overfishing - a result of a trade deal that gave the European Union’s fishing industry the right to exploit Morocco’s fisheries. This brings us back to Mohsin Fikri, the small fish vendor whose swordfish were confiscated by port authorities because Moroccan environmental law does not permit the fishing of swordfish at this time of year. Consequently, the confiscated fish was thrown into a garbage truck by a state official, Mohsin desperately climbed into the garbage truck to retrieve it when the official reportedly told the garbage truck drivers to “crush the hell out of him.” It was in this horrific fashion that Mohsin was killed. Environmental law applied to him, a small fish vendor whose autopsy read: “empty stomach” but not to the glutinous corporations that continue to ravage Morocco’s natural resources. No matter how much the Moroccan regime invests in greenwashing, for Mohsin, Imider and Safi, Morocco cannot possibly look green. What the elite sitting at the lavish tables of the COP22 fail to understand is that there can never be climate justice without social justice.